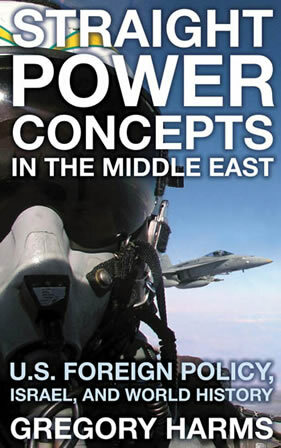 The title of Gregory Harms’ book, Straight Power Concepts in the Middle East, is taken from the quote above, which is from a declassified document in which one of the chief managers of US cold war policy makes clear in a top secret report how strategy should be carried out in, in this case, East Asia. George F. Kennan, who uttered this remark, was Head of the US State Department Policy Planning Staff, 1947-49, when Truman was president. It is a snapshot of the state of mind behind the US’s conduct of its affairs across the globe, especially in developing nations. What began in Korea, Vietnam, and Indochina not long after the report was made, serves as proof that this kind of thinking was both representative and taken quite seriously amongst planners and players. In tracing the outline of US foreign relations, the authority of the repeated confrontations and disputes over America’s various overseas undertakings past and present is predictably called into question. Harms argues that US involvement in the Middle East, and in particular its connection with Israel, is no less the subject of debate. But as in most cases, there is an inversely proportional relationship between facts and opinion: where one predominates, the other plays a marginal role. While legitimate disputes can and do exist, on balance the fundamental historical record is rather clear, and if attended to can narrow the space for contention. His book provides an introduction to US foreign policy that sees the interconnectedness of world history, US history, and current events. To do this he brings the connected aspects of three normally isolated subjects into a single whole. In moving from the general to the particular – the arrival of the European nation state born out of old Empires, the birth and growth of the United States into a world power and America’s eventual intervention in the Middle East and its “special relationship” with Israel and its lobby – Harms applies a form of historical materialist process, which he calls “world-systems analysis”. Established in the 1970s, the academics who developed this method operate from the observation that the current political and economic configuration of the world has its roots in the sixteenth century, also know as "long 16th century", a period that began with the discovery of the Americas and ended with the English Revolution of 1640. Instead of viewing the history of global operations as a daily set of disconnected national activities, world-system analysts identify a global interdependence, one that began with Europe’s conquest of the New World. Columbus's initial 1492 voyage came at a critical time of growing national imperialism and economic competition between developing nation states seeking wealth from the establishment of trade routes and colonies. Harms traces the emergence of nation-states, analyses US foreign relations since 1776 (Declaration of Independence by the thirteen colonies) and then applies this to America's actions in the Middle East and its "special relationship" with Israel. Since the beginning of the twentieth century the fundamental doctrines of American policy have remained the same. In the second half of the century, the United States had extended its sphere to include the Middle East, where it cultivated a client in Israel that would dutifully tend to the superpower’s global programmes. The historical context provided, especially related to the peace process, clarifies recent developments involving the Obama administration. In establishing the outlines of how political, economic and military power tend to be wielded in the international arena, Harms reveals how much of what we see on the news and in the newspapers concerning wars, climate change, conflict, famine and human right abuse is the result of policy. But without a sense of history, each episode can be successfully explained away by heads of states and commentators as being exceptional, with the associated rush of so on, and so forth, information. History lets us cut through this sludge and allows consistency and connection to emerge into the light of day. Harms leads us to the top of the mountain to survey the surrounding vistas and then leaves, but fails to supply a route for the journey home. None the less it is a very rewarding trip. This book should be a initial port of call for students of the Middle East and anyone seeking a deeper analysis than can be found in the mainstream media. But the book is lacking in the development of revolutionary solutions to challenges raised by the last five centuries. From capitalism’s birth, growth, imperialist expansion on to globalisation and decline, and in particular the relationship this question is crucial to all the peoples of the Middle East and the numerous problems faced by them today and how they should begin solve them.